As former custom home builders, we know quality when we see it. We were planning to design and build our own home but were so impressed with the quality of design and construction in a spec home built by Shawn and Jennifer that we asked them to partner with us to build our personal residence. It was a pleasure working with both of them as we tweaked design and space plan details and worked together throughout the entire building and material selection process. Shawn and Jennifer listened to us, understood our goals, offered excellent suggestions, and truly partnered with us to turn our vision into reality. We continue to appreciate our home after 4 years and gladly offer our highest recommendation for Trails End Homebuilders as a builder who demonstrates pride, passion, and integrity. The Walkers have been a delight to work with. The addition they built for us is gorgeous, and the quality is amazing! We worked for many months in the preliminary stages with someone else, and had some very frustrating experiences before we came to them. Jennifer was able to resolve the outstanding issues (and noted some that had escaped our notice!) in very short order. Shawn is very knowledgeable and skilled, which makes it possible for him to supervise multi-disciplinary crews in order to accomplish the tasks at hand. They both have ninja shopping skills, and helped find great deals on just what we wanted! They made suggestions that were insightful and resulted in a project that has turned out even better than we had hoped it would be. From the get-go, it was wonderful to work with Jennifer and Shawn, and we are thrilled with the outcome. We’re almost sorry to be nearing completion; they are like family now, and we will miss seeing them! 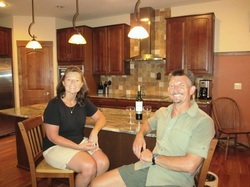 Kit and I wanted you to know how much we are enjoying our newly remodeled home. Thank you for taking a process that can be wrought with difficulties and transforming it into an enjoyable experience. We appreciated the extra effort you made in managing the construction process, reducing any unnecessary stress and your valuable contributions to planning and design. Not only were we pleased with your service and workmanship but also with your honest and open approach to doing business. A trait rarely found in the construction industry. Needless to say, we are grateful of your efforts and would recommend you to any of our friends. We had Trails End remodel our front entryway recently including replacing our two old double doors. They worked closely with us to create a new vision for improving both the aesthetics and functionality of the main entrance to our home. The results were dramatic and pleasing and we couldn't be happier. Shawn and Jennifer went out of their way to ensure that our needs and concerns were foremost in all aspects of the planning and construction for this project. Now, we can't wait to have them remodel our garage.